This is almost half my perfume collection - it's seriously that small. That’s probably not too surprising. Most people like to smell good, right? The thing is, I have a slight challenge when it comes to smelling good because I’m extremely picky when it come to perfumes and fragrances. 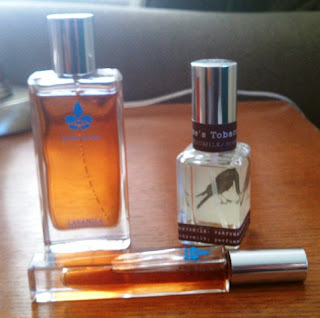 I probably dislike 98% of the perfumes I try – and that’s a conservative estimate. For me, most perfumes are just too strong and heavy. Some are so bad that they give me headaches if I wear them. I’m sensitive, I guess. In general, the types of perfumes that I like are light, clean-smelling scents, like men’s colognes or a basic bar of soap. I don’t mind sweet scents, but I tend them if they are food inspired and while I don’t mind body wash that smells like cake batter, I don’t really want a perfume that smells like cake or candy. I like warm scents too, as long as they’re not too heavy or woodsy. Currently, I have five full-size perfumes in my collection – and even that is somewhat misleading because there is really only one that I wear on a regular basis. I know, I know. It certainly doesn’t fit the ‘light, clean-smelling scents’ bill, but from the first moment that I smelled Vanilla Coconut, I was in love. I am terrible about describing scents, but there’s something so warm and sensual about Vanilla Coconut – but it’s not too heavy. The vanilla note isn’t really all that sweet, and the coconut doesn’t have that artificial sunscreen scent that some perfumes have. Instead, it’s deep, warm, and rich without being overpowering. In case you’re curious, the other full size perfumes in my collection are Philosophy’s Amazing Grace (nice and light), Philosophy’s Pure Grace (clean, light soap-and-water scent), Tokyo Milk’s Poe’s Tobacco (bought mainly because of the name and the awesome raven on the packaging, though the fragrance itself is much lighter and fresher than the name would imply), and Tokyo Milk’s Paper and Cotton (which is a little too spicy and heavy for me to wear on a regular basis). Tokyo Milk Poe's Tobacco 1 oz. - how cool is that raven peeking through the bottle? I think this one's a must-have for Poe fans. Recently, I’ve gotten samples of La Vanila’s Vanilla, which I love, and Jennifer Aniston’s perfume, which, much to my surprise, I like quite a bit as well – it’s got that light, clean kind of scent that I enjoy. Those two are going on my wish list for future purchases. What is your favorite fragrance? Do you wear the same one most days or do you like to mix things up? Is there are a particular type of scent that you’re drawn to? 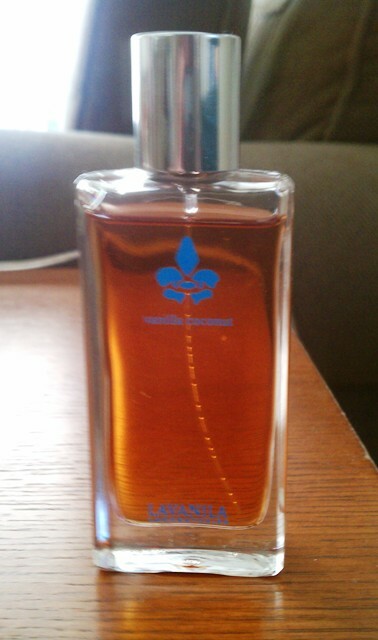 Is there a particular type of scent that you won’t wear?